As people around the world are looking for more “natural” ways to solve everyday tasks/issues such as cleaning, relaxing, sleeping, fighting colds, fighting acne and fighting baby diaper rash, they are turning to essential oils as an alternative to harmful over-the-counter medicines. There are over 700 different plants in the world that contain very beneficial and useful essential oils. There are countless remedies and countless ways in which essential oils can be used for; a few of those have been mentioned above. You can even combine certain essential oils together such as lavender and peppermint or create hundreds of other combinations of essential oils to help soothe and cure certain many aliments, even migraine headaches. 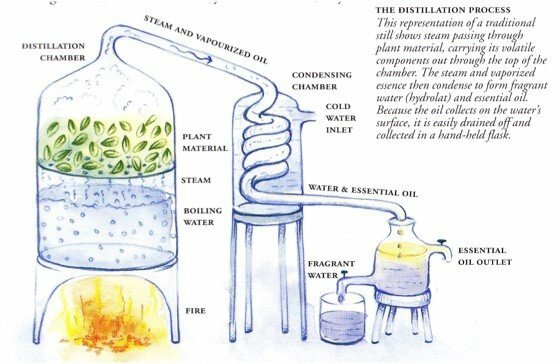 Steam distillation extraction is they most inexpensive way, thus making it the most popular way for extracting oils from plants. In the post below, I have discussed in detail the Steam Distillation process for making essential oils. It provides the basic framework for the everyday “Joe or Jane” to create their own exotic essential oils right from the comfort of their own kitchen. With the steam distillation process, you can have two completely different setups. The first setup method uses a more elaborate Glass Tubing Distillation System method. Once this system is completely setup, it is generally easy to maintain. This distillation method is schematically represented in the next section. 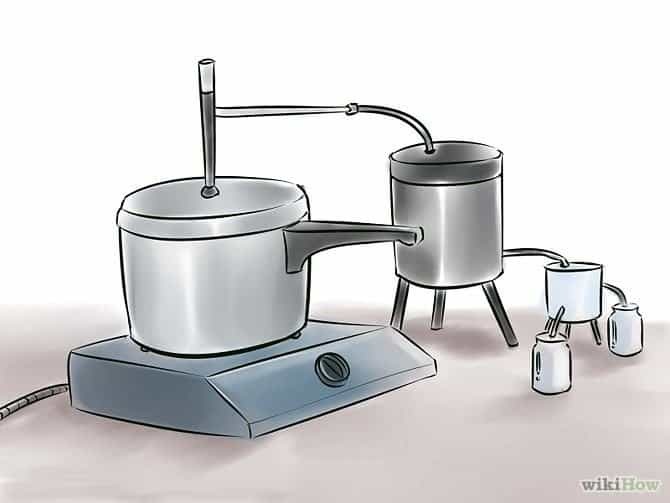 The second, and the one we’re going to discuss in detail, is a Household Pressure Cooker Pot Distillation method, which is far cheaper than the glass tubing distillation system method. The graph below shows the general procedures on how to make essential oils using a glass tubing distillation system. The graph below shows the schematic procedures on how to make essential oils using a household pressure cooker. Plastic hosing (3 inches of 10 mil hosing) to connect the pressure cooker and the piping together plus add a clamp to make the connection watertight. Try to find the copper piping that’s already wrapped in a coil. If you are not able to find this, you can manually coil the copper pipe on your own using an empty propane tank as shown in the above You Tube Video clip. Use a dishwashing plastic bucket. This is where you will add the ice cold water for the distillation “cooling process.” The coil of the copper piping must be submerged in the cold water during the entire process. Get a large glass jug for the Hydrosol (water that has been distilled and which collects in the jug.) Alternatively, you can use a small jug depending on how much essential oils you would like to make. The more raw materials (plants) you have to distill, the more oil that you will end up producing. You may have to do this process 3 times to get enough essential oil to fill even a small eighth-ounce glass jar. It’s a fast setup, but a long process taking up to one hour per batch. And this might need several batches to fill the tiniest of jars. 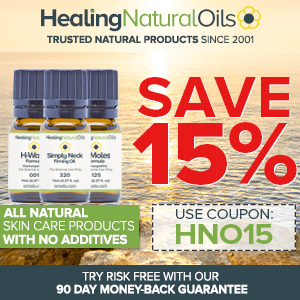 Get an eighth-ounce bottle to collect the essential oil from the hydrosol. Gather the raw materials you’d like to use for this extraction. Add your raw material or bio-mass into the pressure cooker from either your backyard, or you can purchase raw material from the store. Today’s raw material that we’ll talk about is raw lavender as it’s the most popular essential oil due to its antiviral and antibacterial properties. Add enough water to fill your pressure cooker to about ½ to ¾ full. You do NOT want to fill it any higher as you need to allow room for steam to accumulate. 2A. Water. For the best results, only use filtered or distilled water. Put the now lavender filled pressure cooker pot on the stove. Don’t turn on the fire just yet. If you have to coil your copper piping manually, this is the time to do it. If you were able to purchase pre-coiled copper piping, you are set. 4A. If you have to coil your copper piping manually, do it gently so as to not damage the copper piping. Attach one end of the copper piping to the top of the knob on the pressure cooker. Use a small clamp that allows you to use a screwdriver to tighten it deeper. 6A. If after the clamp is screwed on and steam is escaping from the knobs, you can use a strong putty to help seal the steam inside the pressure cooker. Get your plastic bucket ready by filling it with water filled with ice. You will place the “coiled” part of the copper piping into the ice bucket. Get a jar and have the other end of the copper piping inserted into it. Turn on the stove to medium-high and watch your essential oil, along with the hydrosol fill the jar. When you can’t smell the lavender aroma in the house anymore, or it’s dissipated substantially, this means you have completely extracted all the oil you are going to get from the 1st batch of raw lavender. Now that you have one batch completed, you should see essential oil floating in the jar on top of the hydrosol. Use a pipette if using a small jar and slowly extract the essential oil from the top of the hydrosol water as oil and water do not mix. The oil will always sit on top of the water and you will always be able to see it. Take the essential oil that’s now inside the pipette and release it into the eighth-ounce jar. You now have extracted your first batch of essential oil. Yes, you’ve done it! I have included an amazing YouTube Video below to give a good visual of the overall process of the household pressure cooker pot distillation method. Don’t rush to dump out that hydrosol! After they’re done using the hydrosol, many people think it’s useless and dump it out. STOP! Hydrosol has endless uses; as many uses as essential oils themselves. Hydrosol is water based and is harmless to most fabrics including furniture. You can put the hydrosol into a regular old spray bottle and use it as a “homemade” Febreze to spray furniture, beds, and clothes. It can even be used as an air freshener. Other ways to make good use of hydrosol! Now that you are an “expert” on how to make essential oils after reading this report, it’s time to figure out how much this is going to hit your pockets. This will also give you an idea if it’s worth buying your own essential oils from the store, or if you are better off making it from the comfort of your own home. A typical bottle of essential oil of 10-20 ml can cost $15-25. Also, prices vary not only based on the size of the bottle you need but also on the type of essential oil. Over the long term, making your own essential oils could save you money. I’ve summarized the costs of equipments for each method in the table below. Note : Price depends on the size in liters on what a distiller can hold as far as Bio-Mass. 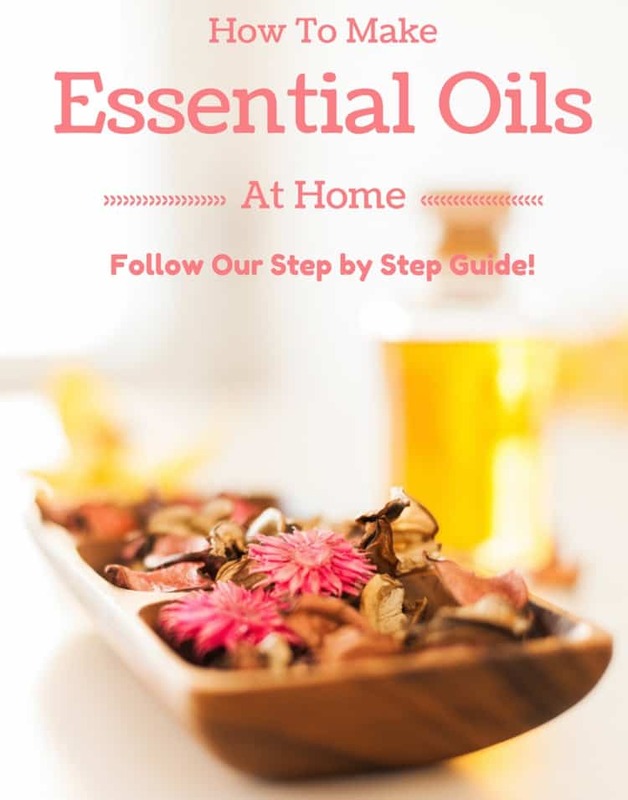 Now that we have talked about how to make essential oils, the equipment you’ll need and how much it’s going to cost you, We need to talk about the safety measures and risks associated with making these essential oils inside your home. First off, it’s a good idea to wear safety goggles while making essential oils. These oils are highly concentrated and therefore, you should protect your skin and eyes well. Damage to the cornea can occur if the essential oil gets into your eye. Secondly, don’t overuse essential oils. If they’re overused, a person runs the risk of the oil becoming toxic to their body. Thirdly, beware when working with potentially flammable essential oils such as linseed oil, also referred to as flaxseed oil. Although this oil is a great source of omega-3s and high fiber content, and has been shown to reduce the risks of heart disease, diabetes, cancers and the symptoms of menopause, linseed oil can become flammable after it has dried on cloth and is in a very warm place such as a garage. There are cases of houses have been burned down to the ground as a result of a person not knowing all the dangers associated with essential oils. I have found a clip below that says a million words. Like many other products, overusing them can be harmful. The same thing goes for essential oils. They are highly concentrated oils that can harm the body if not used properly. This includes putting them directly on the body with no carrier oils to dilute them. Some oils can cause allergic reactions in people who didn’t realize that they were allergic to certain oils. Not all oils are good for aromatherapy. A few oils such as pennyroyal, onion, horseradish and wintergreen are oils that should NOT be used UNLESS told otherwise by a trained aromatherapist. Children should never use essential oils without an adult’s permission as they too could have a reaction to a certain essential oil. Essential oils should never be ingested inside the body unless it’s prescribed by a trained aromatherapist. But remember, if you are EVER in doubt, always consult with a trained aromatherapist. Making your first essential oil in your home is just the beginning. After you’ve become familiar with essential oil basics, you will really be able to get out there and spread your wings. And once you start mixing various types of essential oils, you can literally make hundreds of different combination oils that will bring out your creative side. It might even help you cure a splitting migraine headache, or even help get rid of a nasty cold! Let’s start to make your own essential oils! 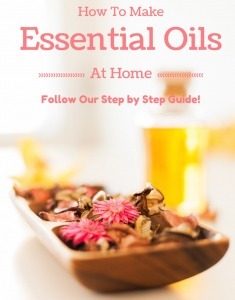 The Organic vs Non-Organic Essential Oils Guide You Will Need To Make Your Purchase! Best way to extract oil from onions?